take these chances: of the cottage cheese variety. 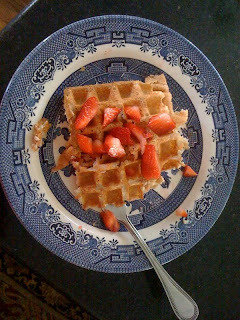 I made waffles this morning - prepared my own batter, used my own waffle iron (or rather, my parents' waffle iron), and then topped them off with fresh strawberries that I sliced and sort of mashed together in an attempt to make them juicy. 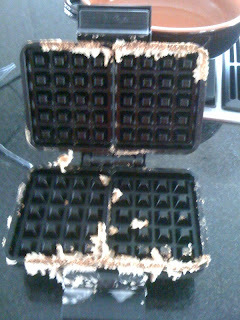 I was going so well until I forgot to spray the waffle iron with PAM. Unfortunately, I poured too much batter, causing the machine to steam and bounce up and down on the counter as if it was mad. No, furious. After one loud pop, however, a startled gasp and jump back on my part, and a chuckle from my dad walking by, my waffles were done. I love waffles. Especially when they're hot and covered in butter and slathered with maple syrup. Mmm. You can never just eat one. Always two. Two waffles is just perfect, so much so, that waffle irons come in twos! Two waffles pop out at a time. Perfect. The problem is not in making two waffles to eat at a time. The probelm is in the amount of calories that have been ingested after those two waffles are gone. 780. These delicious treats don't come cheap - 390 calories a pop. And that's without syrup. Syrup is a whopping 230 calories per 2 ounces. Who only puts 2 ounces of syrup on their waffles? That would only fill up two cubbie holes...maybe! I am in the habit of drenching that sucker. Fill all those cubbie holes until they're overflowing and then fill 'em up again! Well, I've decided that it is not okay to eat over 1,000 calories for breakfast, so I searched for some alternatives and decided to give some "healthy" waffles a try. They really are healthy, I promise. There they are. They look deceivingly similar to their 1,000 calorie cousins, but these two waffles come in at a grand total of 350 calories, strawberries included. Wow! The secret? Cottage cheese. Now don't stop reading because you have a prejudice against cottage cheese. The final product tastes nothing like cottage cheese. The cheese is blended with water and oil and egg whites to create the liquid for the batter. The main ingredient is oatmeal (dry oats). The batter is sweetened by low-calorie sweetener (the recipe calls for Equal; I used Stevia) and vanilla. It was good! I recommend you trying the recipe. I ate a slice of turkey aftewards because frankly, I love turkey, and also because I find that I need a little more protein than most to make it to the next meal. All in all, my breakfast was 410 calories, I ate at 8:30 this morning, and I am still satisfied as noon is approaching. Now, if you're expecting these cuties to taste like they're 1,000 calories, they won't. That's placing unreasonable expectations on our cottage cheese/oatmeal mixture (appetizing?). But they taste good - much like oatmeal or a bran muffin, and the fresh fruit on top sweetens the dish. Be brave! After all, you're cutting over half your calories as well as making a meal that will stick with you until lunch. Put oatmeal, baking powder and sweetener in food processor or blender and process until powdered. Mix the dry and the wet ingredients to form a batter. As the mixture stands it will thicken and it may be necessary to add more water, (a tablespoon at a time), to a get smooth, not lumpy, consistency. Cook in a waffle iron according to the iron's specifications. Haha Stefan...I agree those are much easier. But will they stick?